I don't know what it is this year, but I've been bitten by the Christmas Crafting Bug. My mind is just loaded with ideas and there's not enough time to make them all. I did, however, get one such craft project completed. It was quick & easy. I needed a new wreath for my back door. 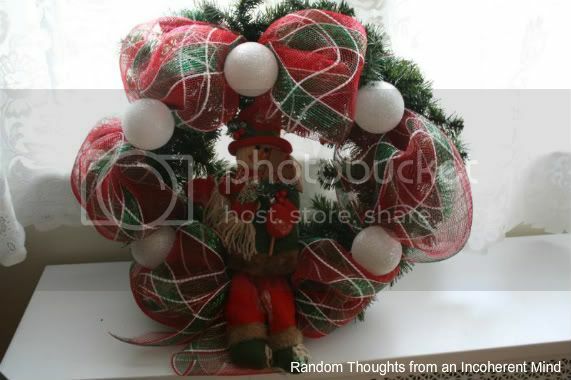 Enter an old wreath, some Deco Mesh & a snowman. Not having any real clue what I was doing, I managed to come up with this. So tell me, has the Christmas Crafting Bug bitten you this year? If so, what are you working on right now? Adorable Gina! I just made a mesh wreath too, like you I had no clue, but was pleasantly surprised how easy it was to work with. I added a snowman to mine too LOL! Omg....I'm so NOT crafty. 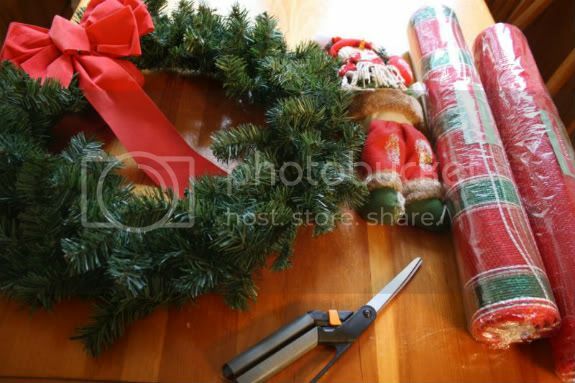 But I have a wreath form (in the shape of a Z) that I need to buy greenery for and attach. Love that mesh you used! I'll have to hunt for some! That's really cute. I got to find some mesh. I buy those wreaths from the boy scouts, my neighbor, every year. They come with an awful bow. This years with white dipped pine cones with bells. I couldn't get those cones off for anything. So I turned them around. I always add an ornament or something to them. I am looking for good ideas to make. I found asakte that I am starting. But, bring on some new ideas. Happy Holidays. 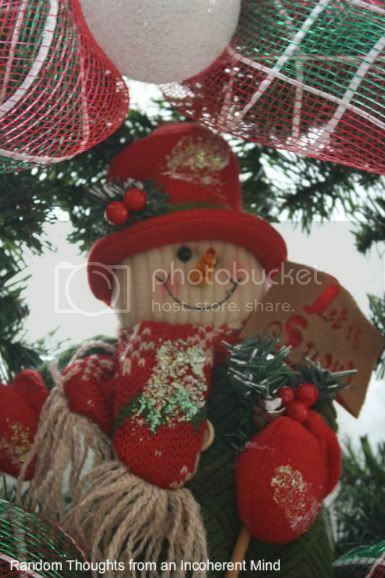 Your little snowman will be a great welcome to all your guests! I love snowmen....they sure were all the rage a number of years back when I operated the gift store. So glad they are still a great decorating idea ! I agree about the "bring on some snow". However,not the cold prairie temps we can get around here . Have a great day my friend! That is adorable Gina! I've never seen the mesh but I so have to try it now.LOL I always redo my old wreaths and it's fun to get a different look each year! How darn cute is that!!! I haven't done any crafting for Christmas, my oldest sons GF is bugging me to have a crafting day so I need to get on it soon!!! I love your wreath. It's so adorable! That is cute! Send some of those creative juices my way! I'm with you...cold and snow...we had about 6" of water in our basement last night...ugh!! However today the sun is out brightly and there is a dusting of snow on the ground....very small dusting but I'll take it over the rain anyday. That is sooo cute!!! I get the crafting bug everyday when I go to work, lucky for me.. sometimes I can create there. There are a few ideas going on in my head .. actually I am ready to make a gingerbread "something". So adorable, Gina! Love the little snowballs! I adore all the red you are using! The mesh wreath is so cute. I bought a large roll of it, but how know if I will get it done! Nope. The crafting bug has not bitten me. Yet. Cute wreath Gina. Last year I was a crafting fool. Not crafting quite a much this year. Last year I made 7 advent calendars. Three for myself (yes, one wasn't enough) lol! and 4 for married children. Thanks for your sweet comments on my blog. Very cute Gina! It has bit me, right in the buttocks I might add...oops... ;)just cannot seem to get enough time to get all these projects done!! No, the crafting bug has not gotten me!! I did some things early for my booth. I love your wreath and I sooo need a new one! Yes! The bug has bitten:) Super cute wreath Girl!! Thanks for your sweet words on my blog...YOU always inspire me too!! Love it Gina, I've bought a couple rolls of the mesh...but haven't used it yet. I need to get busy! have a great weekend! I just watched a mesh video on Pinterest. It is such fabulous stuff. Your wreath turned out beautifully. Your wreath is adorable. I haven't had much time for crafting but I've seen a few things I'd like to make. I saw these candles wrapped in burlap ribbon that looked so pretty. That would at least be quick. I'll be back to see what else you come up with! That looks cute. I had a roll of mesh in my hands today and put it back because I wasn't sure what to do with it. Kah-yute, Gina! And 'green' to boot!! I bought a roll of that at SAMs last month, have no idea what I am going to make with it! Love your wreath! But not your wishes for cold and snow after last year! And when I got an oil delivery last week and it was 4.20 a gallon I prayed for continued mild weather! Enjoy this beautiful Sunday! I hope to get my outside deco done! I love your snowman wreath. I collect snowmen, and I'll show them soon. I have been working on a craft project that is taking so much more time than I thought. But it is something that I want to finish. Love it! Every year I get the Crafting Flu bad, but there is just not enough time for everthing...Very busy month. But I don't have to tell you that when ever I can I craft my little heart out :-) It is freezing here at 32 degrees in some areas...Burrr. I can't believe it :-) Hope the weather gets a little cooler for you soon.